You play an archeologist whose mission is to return the missing feathers to the golden Phoenix. Use your harpoon-gun to fire a rope to higher platforms and then climb up. Use your flashlight to dazzle stun the attacking dinosaurs and cavemen. Use the harpoon which shoots out a rope at an angle and attaches to higher platforms. 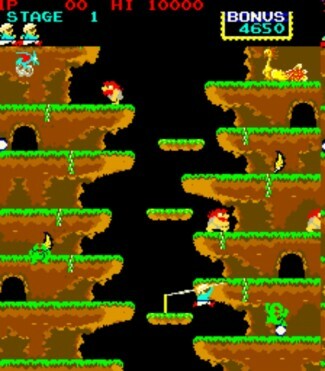 Climb along the rope to move up the screen, climb down vines on some platforms to move down. Avoid dinosaurs and cavemen who can also climb along rope causing it to shake and you to fall off if both moving. Use flash light to dazzle enemies for a limited time. Reach the Phoenix at the top of the screen to advance. You receive bonus points for collecting the two tail feathers dropped by the Phoenix. Collect the golden egg for the ability to kill enemies by walking into them for a short period of time. Only one rope can be used on the screen at at time so if you shoot again while another enemy is climbing the current rope, they will fall and die.